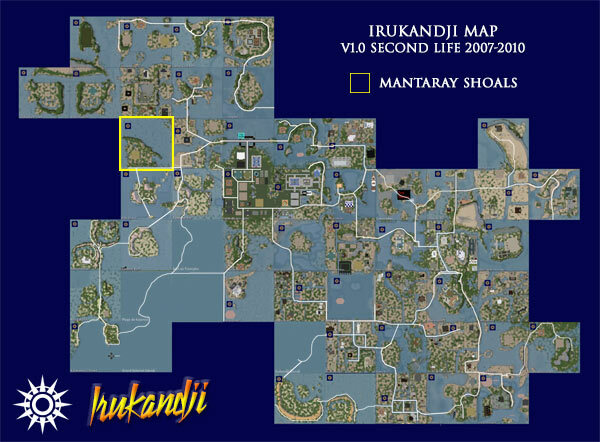 Located in the far northwest of the Irukandji continent, Mantaray Shoals was part of Jillaroo State. The landscape was 100% original and terraformed by hand. Mantaray Shoals was predominantly open sea with one large triangular land mass near the southwest corner. The islet contained two residential parcels. The eastern shore of Mantaray Shoals formed the beach of neighbouring Coraki Lagoons. Clockwise from NW, the island was bordered by Yeppoon Atolls, Jackaroo Island, Tanawayo Bay, Coraki Lagoons, Aquitaine Bay, and Palu Island. A terminus branch of the Trans Irukandji Causeway ran along the southern edge of Mantaray Shoals. Apart from the aerial map above, it appears that no photographs survive of Mantaray Shoals. If you happened to have visited there and took photos and wish to share them on this page, please let me know via the comment section below.